How is Disability Defined by Social Security? You broke your arm and now cannot even write your name. A car accident has left you paralyzed and unable to move. Cancer has left you fatigued and unable to work an eight-hour day. In any of these situations, would you be considered disabled? It’s possible, but it depends on the situation. 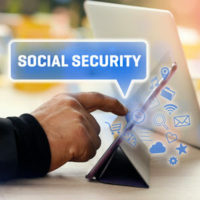 In order to receive Social Security Disability benefits, the Social Security Administration (SSA) has certain requirements that need to be met. Whether or not you are considered will also depend on the degree of your injury as well as the duties of your job. What are the requirements for receiving Social Security Disability benefits? Do you qualify? Read on to learn more. The definition of disability varies from one person to another. That’s why the SSA has strict requirements. In order to qualify for benefits, you must be fully disabled for an extended period of time. The agency does not pay benefits for short-term disability or partial disability. First, the SSA considers you disabled if you cannot do the work that you did before the injury or illness. For example, if you are a writer and you lost both arms in a horrific accident, then you likely would be considered disabled. The SSA would want to see if you could adjust to other work first, and if you lost both arms, that would be highly unlikely. The other criterion is that your disability has to last one year or longer or result in death. Examples would be amputation, paralysis or cancer. Even if your doctor considers you disabled, that does not mean that the SSA finds you worthy of disability benefits. Determining disability is a five-step process. To make their determination, first the SSA will look at your work history. They will then assess the severity of your disability. Next, they will determine if your disability equals one of the listings found in their guide. The SSA will then decide if you can continue to do the work duties you did before the disability. Finally, they will look at your age, experience and education and determine if you can adapt to another type of work. If you are approved, there is a five-month waiting period. The SSA may review your case from time to time to see if you are still considered disabled. If so, your benefits will continue as usual. If not, your benefits will end. If you are denied benefits, there is the opportunity to appeal the decision. Although you can do this on your own, having a lawyer on your side can greatly improve your chances of success. Getting the benefits you need following a disability is not an easy task. There are criteria that must be met in order to be approved. If you believe you are disabled and have been denied benefits, The Law Office of Michael Lawrence Varon can help. He has the knowledge and experience to fight for his clients’ rights. Schedule a free consultation by calling 914-294-2145.